This exhibition by the Deutschen Plakat Museum and the Grafische Sammlung im Museum Folkwang combines graphics series by the woodcutter HAP Grieshaber (1909-1981) with posters he designed and printed. 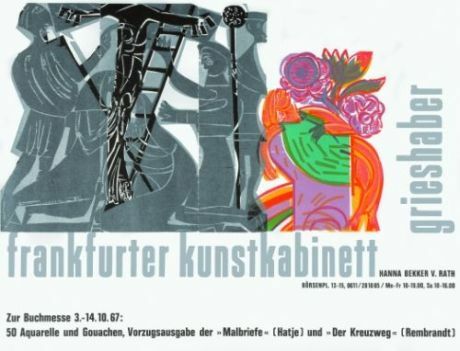 The series, made between 1959 and 1969, illustrate musical works (Carmina Burana and The Firebird Suite) and take up religious, political and social themes (The Polish Crossroad among others). The central series is Der Basler Totentanz, (The Basle Dance of Death) whose 40 illustrations draw on late medieval models. The posters shown at the same time take up the series’ themes, supplementing or illustrating them. Altogether, the exhibition shows 90 graphic illustrations and about 30 posters. With the exhibition, a catalogue is published by Edition Folkwang/Steidl. Graphic series in the Collection Online. Poster in the Collection Online.